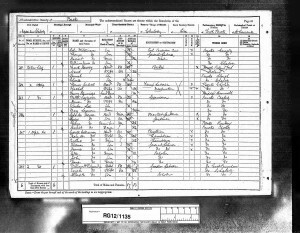 Reuben Abel Seymour was born “Abel Reuben Lee” in Eastbourne on 13 July 1889. His mother, Annie Ruth Lee, who grew up in Chalvey, near Eton in Buckinghamshire, married Walter Robert Seymour also of Chalvey in 1890. 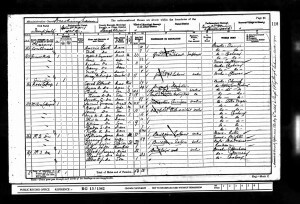 The 1891 census shows Reuben “Lee”, aged 2, living with parents Walter and Annie Seymour. 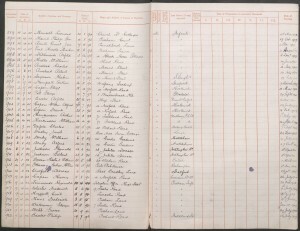 On subsequent census returns, from 1901 onwards, Reuben’s surname is Seymour. Annie and Walter had two daughters, Mary born in 1891 and Emily born in 1892. The family continued to live in Chalvey. 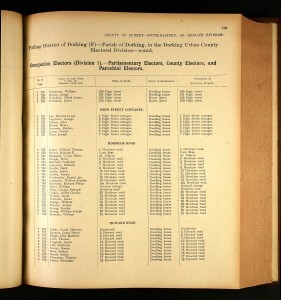 The 1901 census reveals that Walter at that time was a gravel merchant. However, that year Walter died at the age of just 33 and Reuben who was then aged 12, moved to Dorking with his mother and sisters. Reuben, who had previously been to school in Slough, was enrolled at St Martin’s C of E School for Boys. The family was then living at 14 Mount Street in Dorking. By 1911 Reuben was living with his mother and sister Mary at 2 Heath Hill, Dene Street. 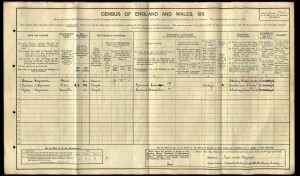 Reuben was working as a general labourer and his sister was a general domestic. According to the electoral register his address in 1915, the year he died, was 5 High Street Cottages, Dorking. 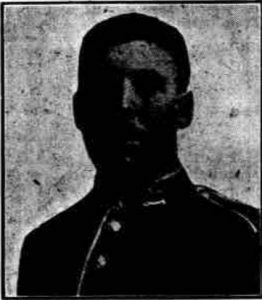 Reuben enlisted at Guildford, joining the 2nd Battalion, The Queen’s (Royal West Surrey) Regiment. “Pte. Reuben A. Seymour of the 2nd Batt. Queen’s R.W.S. 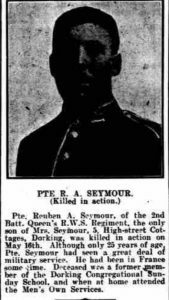 Regiment, the only son of Mrs. Seymour, 5 High Street Cottages, Dorking, was killed in action on May 16th. Although only 25 years of age, Pte. Seymour had seen a great deal of military service. He had been in France some time. Deceased was a former member of the Dorking Congregational Sunday School, and when at home attended the Men’s Own Services. He died during the spring offensive in the Pas de Calais that resulted in many thousands of casualties. Reuben’s death coincides with the battle of Festubert (15-25 May 1915). 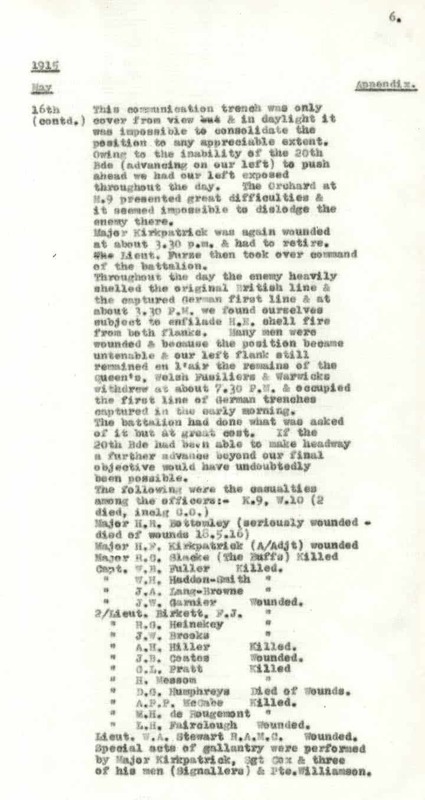 The regimental war diary for 16 May 1915, the day Reuben Seymour died, shows that the 2nd battalion was very active. The troops were given a ration of rum at 2.30 am and then the German lines were shelled for half an hour before the troops scaled ladders from their trenches and rushed toward the Germans at daybreak. 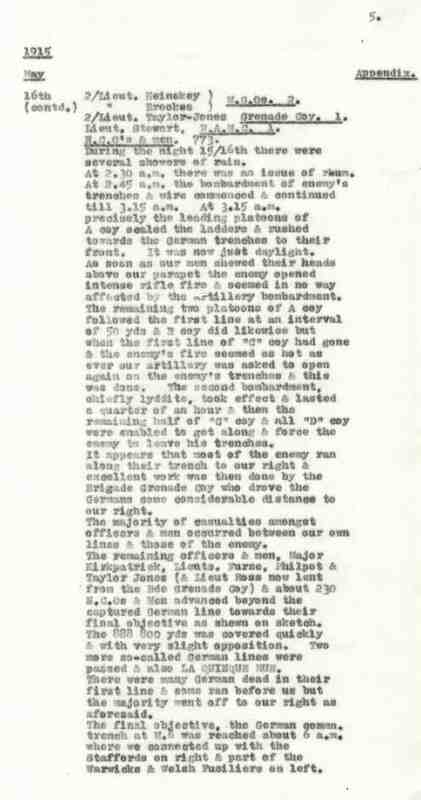 They faced unexpectedly heavy fire from the Germans but a second round of artillery fire forced the Germans to retreat from their trenches. 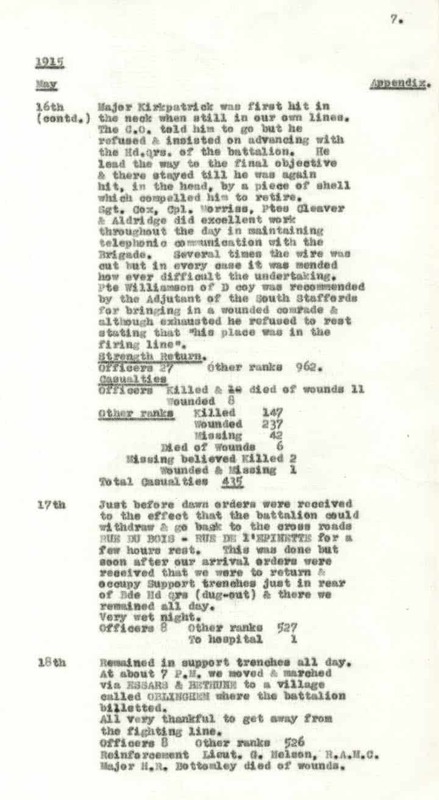 The diary reports that most casualties fell between the two front lines. 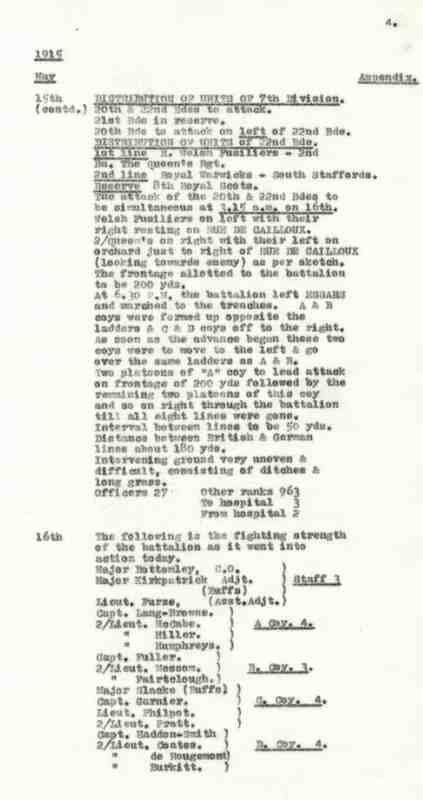 After crossing two or three German front line trenches the communication trench was taken and further adjoining stretches of the trench were captured by the Staffordshire Regiment and Warwickshire and Welsh Fusiliers. However the British forces were unable to make any further progress or consolidate their position and facing a heavy German onslaught were forced to retreat that evening. Private Reuben Seymour’s name is on the memorial at Le Touret, Pas de Calais.